Photo copyright 2011 Auto Imagery, Inc. In stark contrast to the conditions just a week ago in Charlotte, the all-concrete surface at Texas Motorplex was probably hot enough to fry an egg on Sunday during final eliminations of the AAA Texas NHRA Fall Nationals, but that certainly didn't put a damper on the efforts of the Lucas Oil Series drivers seeking a Wally. 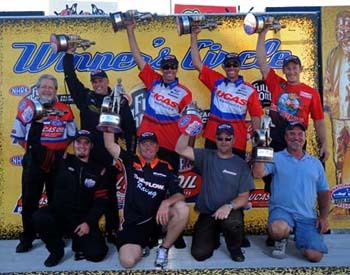 Chase Copeland (Top Alcohol Dragster), Tony Bartone (Top Alcohol Funny Car), Bruno Massel (Comp), Jerry Emmons (Super Stock), Gary Emmons (Stock), Richard Pierson (Super Comp), Tommy Phillips (Super Gas) and Phil Unruh (Top Dragster) were the deservedly rewarded sportsman racers at the conclusion of the event. The Pasadena, Texas-area based Emmons brothers weren't too far from home, and their respective comfort levels were evident as they plowed through the competition in the Super Stock and Stock Eliminator categories for a family double-up. It was the second time that members of the Emmons family had both won at the same event: in 1999, brothers Terry and Harvey (more commonly known as Speedy) both titled in Memphis - Terry in Super Stock and Harvey in Stock. 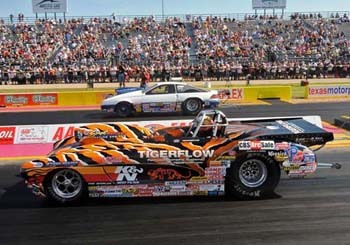 The Super Stock final in Dallas was Jerry vs. two-time national event winner Chris Chaney, currently fifth in the national standings with a win in Topeka on his 2011 list of accomplishments. Competing in his 20th national event final, Jerry was first off the starting line driving his GT/BA '05 Cavalier, .020 to .035, and scored his 12th national trophy on a holeshot - both drivers dialed 9.82 and Jerry clocked a 9.865 to defeat Chaney's 9.863 by .0138-second, which translates to about three feet. Lucas Oil campaigner Jerry opened eliminations with a win over breakout opponent Gary Coccaro then used a .011 reaction and dead-on 9.736 to top Pete Peery's breakout 9.821 (9.83 dial), and in the third round he was a perfect .000 at the tree and stretched his legs with a 9.800 after Jonathan Womack was unable to make the call. After surviving a double-breakout with Justin Jenkins in the quarterfinals (the same round where Chaney ousted brother Harvey), Jerry successfully challenged Todd Morse, driver of the GT/FA '88 Mustang, in the semis: Morse launched first, .038 to .043, but Jerry ran closer to his dial to advance. 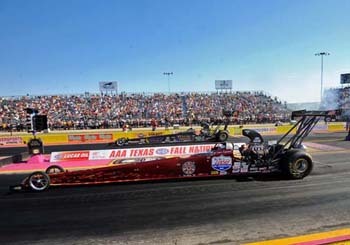 Notably, Jerry is perfect at the Texas Motorplex in final rounds: he has four times made the trek to the money round at the national level and each time walked away a winner. In addition to this season's victory, he was also triumphant in 2008, 1997 and 1994. 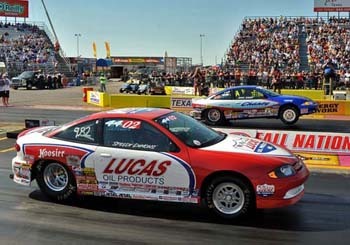 Gary won his eighth national event in his 13th final round by first recording a stellar .003 reaction to Slate Cummings' .024 in the Stock Eliminator finale and then running closer to his dial in the Emmons Motorsports Lucas Oil-backed C/SA '98 Firebird to survive their double-breakout finish. Cummings, this season's Chicago winner and a driver looking to finish in the top 10 in the series standings, was competing in his third Dallas final; he was runner-up last season and also ended the weekend in the closing round next to Jerry in 2008. Though Gary has had success in Texas as the 1992 winner in Houston, this year's Dallas event marked his first final round at Texas Motorplex. Bill Hatcher was first to fall to Gary during eliminations, and he then disposed of Brett Candies, son of Paul Candies (of Candies & Hughes fame). Gary was second to launch but played the finish line to his advantage; Candies broke out by two-thousandths to his 10.575 (10.56). Next came a very close round with Jacob Pitt in which Gary was a flashy .001 at the hit to Pitt's .042 and then almost gave it back, getting the win light by just .0089-second. Gary was better at both ends of the track for the quarterfinals win over Hagen Gary, and the success came with a bye run into the final. Massel, who also won in Atlanta earlier this year, moved up in the national standings to the fourth position with his win over current No. 6 spot occupier Clint Neff in the Comp Eliminator final. Neff out-witted Charlie Stewart, Greg Porter, Raymond Martin and Alan Ellis but saw red in the trophy round when he launched .025-second too soon. The title was the third consecutive for Massel at the historic facility and marked his sixth overall national win in ten final rounds. Massel, of Woodridge, Ill., drove his turbo charged Cobalt around a troubled Pete Carbery in the first round before opponent Chris McGaha turned it red in round two, and in the third act he wheeled his DD/AT entry to a .52-under the 7.71 index to get around Mike Trumble's .52-under the 8.48 target for a .0103-second win. In the semifinals, Massel was quicker at the tree, .037 to .084, and first to the finish on a .50-under the 7.69 index to better championship chaser Lou Ficco Jr.'s .49-under the B/AP's 7.79 bullseye. The Top Dragster competitors hadn't been out since Sonoma, and this season's Houston Super Stock runner-up Unruh took advantage of their return to action to earn his first national event title. The McPherson, Kan., driver was out of the gate first in the closing round, .031 to .047, and got the nod with a 6.518 (6.48 dial) to first-time finalist Allen Constantine's 6.689 (6.65). The margin of victory was .0179, or about five feet. Rodney Frazier's red light in round one set Unruh up for a second-round match with Mallori Rodgers. Unruh cut a fair .020 light and Rodgers was a hundredth quicker in reaction, but down the stretch favor turned to the eventual event winner as he crossed the finish line dead-on the money on his 6.49 dial to his challenger's 6.631 (6.60). Larry Eidson ran into a case of trembling tires as he left the starting line and was unable to near his number in the quarterfinals, and Shane Lejeune ran into trouble 400 feet into the run and had to shut it off in the semifinals, paving the road to Unruh's victory. The Super Comp results conjured memories a-plenty for Pierson, whose other final round - and win - was at the same event in 2008. Last time it was Austin Williams finishing second, and this time it was first-time finalist Michael Johnston. Pierson had a remarkable package in their end-of-the-day powwow, launching in .018-second and tripping the final timer with an 8.909 on the 8.90 index. Johnston broke out by two-thousandths. Other notable rounds for the Edgewood, Texas, driver included a .002-second margin of victory over Steve Evans in the fourth round and a perfect .000 reaction in the semifinals to aid in the defeat of Alan Savage, who was on the wrong end of their double-breakout competition. Super Gas racer Phillips earned his 24th national event win and his third of the season (he scored titles in Super Comp in Houston and Super Gas in Bristol) with a final-round defeat of Jay Peppler, who was first off the line but not quite close enough to the 9.90 index; Phillips' 9.947 topped his 9.978. 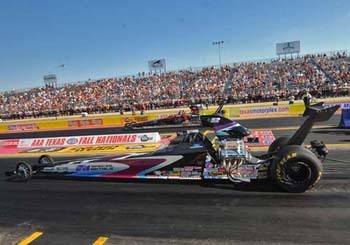 Forney, Texas, driver Phillips brought in the first national event Wally of his career at Texas Motorplex in 1995 when he won Super Comp, and since then has collected trophies at the event in 2005 (Super Comp), 2008 and 2010 (both Super Gas). Phillips is currently anchored in the middle of the top 10 in the national standings. After tucking away a victory over Jason Richey in the first round, Phillips advanced without challenge when James Carter was red at the starting line. Round three gave the opportunity to bring it all to the table, and Phillips was an awesome .002 at the tree and cleared the finish line four-thousandths over the index to Ryan Baudoin's great .006 launch and 9.928. The fourth round was a close one for Phillips, as he began his pass on a .021 reaction to John Salter's .022 and the pair were glued together as they raced down the track. The scoreboard in Phillips' lane flashed a 9.946 to Salter's opposing 9.949, and the decision was in his favor by just .004-second. When Val Torres Jr. broke out in the quarterfinals, Phillips scored a bye run into the final. Copeland wheeled Gene Snow's Top Alcohol Dragster to the winner's circle and tallied his second straight win at the event. The defending champ took on Aaron Tatum in the big round and the pair launched nearly identical, but Copeland soon took over the lead in his A/Fuel dragster and carried it to career win No. 2, 5.344 to 5.546. Copeland had the car to beat throughout the weekend and was No. 1 qualifier with a 5.280 at 276.80 that also marked low e.t. and top speed of the meet. Gainesville, Texas, resident Copeland had the bye run in the first round and then went another 5.28 to take out James Thompson in the quarterfinals, and Shayne Lawson' 5.403 to Copeland's 5.336 in the semifinals wasn't enough to stand in his way. Copeland was situated 8th in the national standings at the time of this writing. 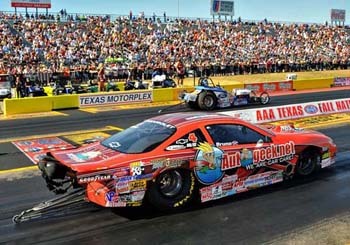 Top Alcohol Funny Car victor Bartone started the weekend at Texas Motorplex on a high note, recording the 35th No. 1 qualifier award of his career and 33rd in the category based on a stout 5.553 at 262.44 mph that would carry through for low e.t. and top speed honors at the conclusion of the event. In the final, Long Island City, N.Y., driver Bartone lost a little at the starting line to Roger Bateman, but just past the 330-foot timer he gained the advantage and kept ahead for a 5.638 to 5.667 victory that would be the 35th of his career. It was the first time that Bartone had been to the Dallas final round since his three consecutive appearances in 1996 (a win over Terry Mullins), 1997 (a win over Vern Moats) and 1998 (runner-up to Cy Chesterman). The opening round saw the advantage in the hands of Bill Davis when Bartone, driving the Steve Boggs and Darren Mayer-tuned Centre Pointe Collision Center entry, was .102 in reaction time to Davis' .052, but the 330 timer was where the lead changed hands, and Bartone earned his 300th round win with the defeat. After taking out Napa-backed John Lombardo Jr. in the quarterfinals by .0224, Bartone was handed a freebie when Mickey Ferro recorded a -.172 red light. We're right in the middle of a three-race streak: The next stop on the Full Throttle Series tour is Maple Grove Raceway in Reading, Pa., and Lucas Oil drivers will be seeking points and trophies at the event in only a few days, Sept. 29 - Oct. 1. Sunday's Lucas Oil Drag Racing Series final results from the 26th annual AAA Texas NHRA Fall Nationals at Texas Motorplex. Top Alcohol Dragster -- Chase Copeland, 5.344, 275.62 def. Aaron Tatum, 5.546, 257.43. 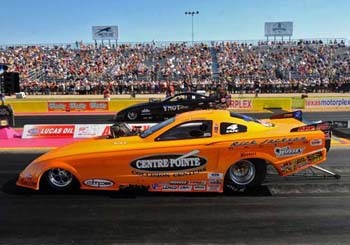 Top Alcohol Funny Car -- Tony Bartone, Ford Mustang, 5.638, 260.06 def. Roger Bateman, Mustang, 5.667, 254.14. Competition Eliminator -- Bruno Massel, Chevy Cobalt, 7.898, 130.92 def. Clint Neff, '23-T Ford, foul. Super Stock -- Jerry Emmons, Chevy Cavalier, 9.865, 132.33 def. Chris Chaney, Cavalier, 9.863, 130.75. 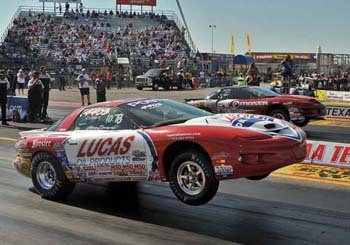 Stock Eliminator -- Gary Emmons, Pontiac Firebird, 10.774, 114.55 def. Slate Cummings, Firebird, 10.472, 124.98. 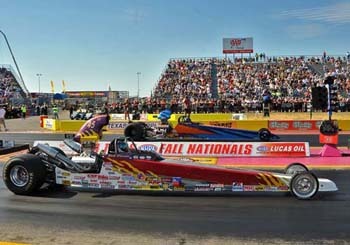 Super Comp -- Richard Pierson, Dragster, 8.909, 167.14 def. Michael Johnston, Dragster, 8.898, 169.47. Super Gas -- Tommy Phillips, Chevy Corvette, 9.947, 152.80 def. Jay Peppler, Ford Probe, 9.978, 147.23. Top Dragster -- Phil Unruh, Dragster, 6.518, 202.64 def. Allen Constantine, Dragster, 6.689, 196.42.